Lebbeus Woods, Architect is on view at SFMOMA till June 2. Open Space is pleased to be hosting a series of posts on Woods’s work and legacy. Today, please welcome architect Dwayne Oyler. Over the last few months, it’s been astounding to hear of Lebbeus’s vast influence, sometimes from the most unexpected people. Countless students, colleagues, admirers, and scholars have discussed the ways in which their work has been shaped by his work. And of particular note has been the number of architects and educators who cherished the constant architectural dialogue they had with Lebbeus over the years. They’ve spoken of endless philosophical conversations, debates on the state of our profession, and discussion surrounding the ongoing work of their academic studios. Their comments have led me to reflect on my own relationship with Lebbeus, working closely with him on a series of projects in the late 1990s. Looking back now on those years of work, it’s clear that Lebbeus and I had a different kind of relationship — one that relied less on a verbal dialogue and more on the visual and physical work as part of an ongoing conversation. 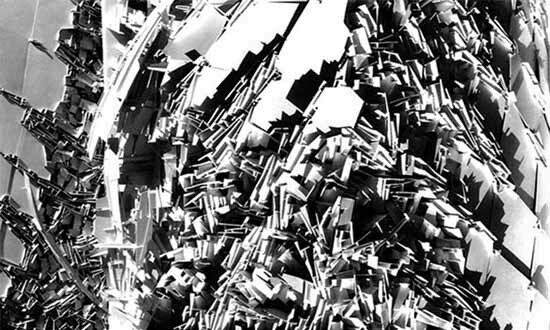 I first met Lebbeus in the fall of 1996 in his studio in Lower Manhattan. Thirty-two years my elder, he was a towering figure, both within the discipline and as a physical being. Twenty-four at the time, I was timid and quiet, and he often introduced me as a “man of few words.” We spoke often of personal issues — our ups and downs, paying the New York rent, and our travels. But unlike what seems to have been everyone else’s experience, we spoke little of the specifics of the work. In retrospect, I often wish we had had those conversations, but I find comfort in believing that we had an equally powerful form of communication in the back and forth between models and drawings. Our first conversation took place standing over a preliminary drawing of Siteline Vienna. Lebbeus spoke very briefly of his interest in the city and the key elements he wanted to engage, while I stood quietly immersed in the power of the drawing. The following week, I produced several small models (a couple are included in the current SFMOMA exhibition), originally built in white museum board. 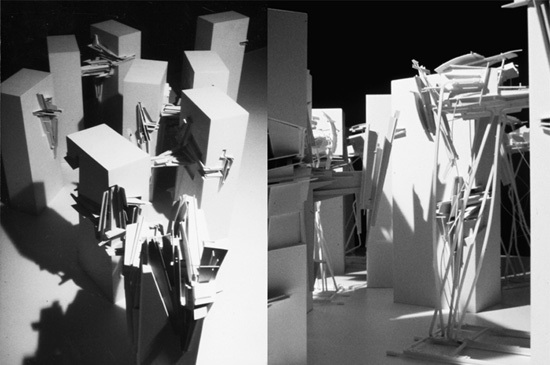 When I showed them to Lebbeus, he offered one of the few comments he ever made directly about a model, talking at length about the issue of intentionality. 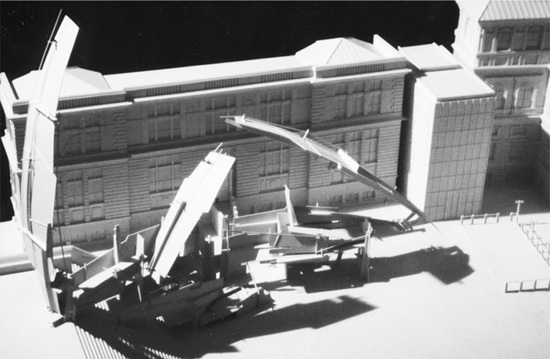 Because the models were made of museum board, there were several stick-like elements that had a slight bend to them. Although they were minor details, they brought into question whether these elements were meant to bend or not, and Lebbeus felt that there should be no ambiguity about the intentions. Interestingly, he never discussed what was right, what was wrong, what he liked, or what he didn’t like. He didn’t mention the formal aspects of the model, the color, or the specific forms of engagement with the urban elements. He spoke only of intentionality. Later work was produced as a simple exchange of visual and physical ideas — Lebbeus would leave me a sketchbook to look through (truly amazing), and I would respond with a model. The years that followed brought roughly a dozen models that were built as part of that dialogue, including numerous Siteline Vienna Interventions, the Terrain Project, and Nine Reconstructed Boxes. With each new model came a greater understanding of the principles that guided that early conversation — both what he said and, more importantly, what he didn’t say. First, Lebbeus was profoundly concerned with the physical. He is often cited as a “visionary,” but I find that that title in many ways diminishes his value as an architect. The work wasn’t merely scenographic; the decisions were carefully calibrated and intentional, and he wanted that to be clear. He was deeply concerned with the physical world, and the models were a way both to demonstrate that concern and to test ideas in a way that was closest to how he imagined they might exist in reality. Later, while I was teaching with Lebbeus, he often pointed out that even in his most radical projects, he was clearly interested in materiality and tectonics. He encouraged work that began abstractly and conceptually and that had a strong social agenda, but he insisted that the work become manifest through a physical proposal. He believed that the work was, in a sense, a language. By that I mean, it had its own formal logic — one that, when studied, could be shaped into variants and dialects, while still maintaining its core meaning. I came to learn that there were shapes that just didn’t work (notice, for example, the extremely minimal use of acute angles within any single tectonic element), not because Lebbeus said they didn’t work, but because they weren’t a part of the vocabulary. The nuanced and complex language of his drawings continues to offer something new nearly every time I see them. Lebbeus believed in true collaboration, and he thought that everyone who had a hand in a project brought something to the table. Over the years, he worked with several other collaborators, usually one at a time for a few years each, slowly chipping away at projects. He had an intense interest in cultivating the ideas of a younger generation, and this can be seen in everything from the collaborative work, to the students he taught, to the profoundly intelligent dialogue that he kept going on his blog. In the work we did together, while I always adhered to the architectural language that he set forth, I almost never built a model exactly the way it was drawn — and Lebbeus’s encouragement to expand on the drawings was one of his great virtues. The idea was always that the models kept the conversation moving forward. In fact, he was sometimes surprised by the outcome of the models (I remember his surprise at the curvature and deep sectional character added to the Terrain model). But I was only picking up on a set of principles he had laid out in so many early projects — just another example of a conversation that didn’t need to be spoken. For the incredible generosity, wisdom, and words unspoken, I am forever grateful. Dwayne Oyler is a principal in the architecture and design office of Oyler Wu Collaborative in Los Angeles. He received a Master of Architecture from the Graduate School of Design at Harvard University. He has taught at the Cooper Union in New York and currently teaches design studios at the Southern California Institute of Architecture (SCI-Arc). All images in this post courtesy Dwayne Oyler. Follow the Lebbeus Woods, Architect series here.